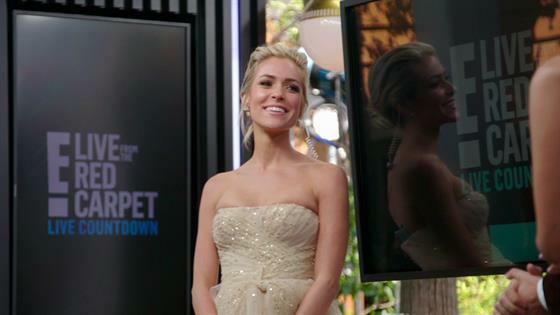 Can Uncommon James run smoothly without Kristin Cavallari's presence? On this week's all-new Very Cavallari, Kristin headed to Los Angeles for the Oscars and left husband Jay Cutler in charge of her dramatic employees. Although it was the "worst time" for The Hills alum to jet set to the West Coast, Jay was more than eager to offer up his services. "I can go down there and whip 'em into shape real quick," Jay offered. "Okay. What are you gonna do, you just show up?" Kristin inquired. "Actually, I think that's a genius idea because then we could see what they're really up to." Of course, the Uncommon James team didn't take the NFL star's presence in the store well, especially Shannon Ford. Following through on his promise to Kristin, Jay stopped by Uncommon James to see what Shannon, Brittainy Taylor and Reagan Agee were up to. "Well, well, least someone is working around here," Jay later remarked while inspecting the scene. In typical Jay fashion, Cutler offered up plenty of criticism regarding the team's work ethic and dished out advice on how the store should be operated. Per the retired quarterback, he "launched this empire." "His kids are too young for him to be really mean to 'em yet, so he just needs to have some outlet for that," Shannon hypothesized to the Very Cavallari cameras. After Jay was particularly hard on Shannon, the social media director decided that a "Jay free office" would be best for everyone involved. Nonetheless, the father of three's visit to the office made it so Kristin could get business done in the Golden State. Prior to her E! News gig at the Oscars, Kristin met with a group of influencers for a blogger luncheon. During this sit down, Kristin met with "the best of the best in the blogger world" to promote her Uncommon James spring line. "The girls coming today are some of the heaviest hitters in the blogger world," Kristin later explained. "They all have a ton of followers, and so if these girls are wearing my jewelry, it can really help boost sales." Thankfully, the luncheon was a total success as it resulted in the business selling out of several pieces. "The Uncommon James glow up has been pretty impressive," Shannon noted in a confessional. "I was there when we were having, you know, 10 to 20 orders a day and now we have hundreds of orders a day." However, amid all this success, one Uncommon James team member was noticeably absent. After not hearing back from model Taylor Monaco about an upcoming photoshoot, Shannon checked in with her best friend and learned that the brunette stunner was battling some undefined sickness. When Taylor was unable to shake off the bug, Shannon immediately jumped to the conclusion that her friend was pregnant. "Taylor's been sick every morning for the past four days," Shannon admitted to the Very Cavallari cameras. "Things aren't adding up to me and I'm gonna go figure this out." In order to figure out what exactly was going on, Shannon showed up to Taylor's place with pregnancy tests. "It makes me weirded out that you were actually throwing up, I feel like these are side effects to being pregnant," Shannon confessed to her gal pal. "I knew you were going to say some s--t like this," Taylor retorted. "There's no way I could be pregnant." Regardless, after some prodding by Shannon, Taylor agreed to take the tests…and did not get the answer she was expecting. "Shannon, can you get a false positive?" a stunned Taylor asked her bestie. "That definitely says, 'pregnant,'" the social media expert announced. Unsurprisingly, this news left Taylor very stunned and concerned about what her loved ones would think. In the hope of calming down her friend, Shannon reminded Taylor that "this isn't Pinterest, it's your life, it doesn't have to play out accordingly." Eventually, Taylor came around to the "blessing" that is this pregnancy. "I'm nervous as hell, but I like weirdly just got a little bit excited," Taylor added. Despite her life changing news, Taylor got all dressed up and joined the rest of the Uncommon James team at Wirth Campbell's house for an Oscar viewing party. Not to mention, everyone was far too busy paying attention to Kristin's red carpet work to dig into Taylor's personal life. "Having an Oscar viewing party is so much fun, I can't wait to see Kristin looking so beautiful," Brittainy admitted in a confessional. "I kind of need to sit back, relax and fangirl a little bit." Even Shannon was impressed with Kristin's Oscars coverage and revealed that she sometimes forgets "how big of a deal she is."